Buying a kennel, a dog bowl, a bed, and toys for the impending arrival of a puppy or dog is an exciting experience. While it’s typically not something you search for when you don’t need one, you will be amazed at the variety that’s available to suit your dog’s needs. Not only do they come in a range of shapes and sizes to suit different snouts, but you can also choose from various materials, styles, and price tags. The sky’s the limit when it comes to selecting a new dog bowl for your dog. If your dog’s a chewer, you are best to avoid plastic bowls they can destroy and treat as a toy. However, if your dog is destructive, even a ceramic dish might be too tempting as they are easy to break when dropped. Tin bowls can warm up in the sun but can’t be chewed, while concrete bowls are more suitable for outside use. Some are designed to suit your home’s décor, while others come with cute dog bone patterns and pretty designs. In fact, many also come on stands so that your dog doesn’t need to bend down or stand in uncomfortable positions. Think about what you need in a dog bowl and consider any of these options below. You are sure to have a lot of fun choosing both the dog and the accompanying dog bowl and accessories. For some dogs, it can be difficult to bend down and eat food from a dog bowl on the floor. It can cause bloating for some breeds, and for older dogs, it can irritate arthritic or stiff joints. 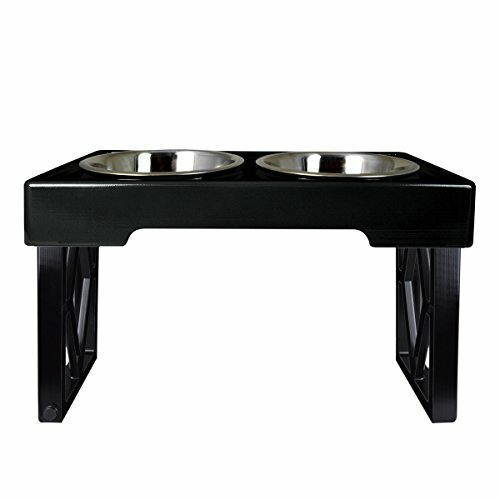 If your dog is one of the many that benefits from a raised dog bowl rather than a ground-based one, consider this designer diner from Pet Zone. One of the best features of this foldable table is how it caters to dogs of all sizes. When they are puppies, the table can be on its lowest setting, and as the dog grows, the table grows with it. It’s an intelligent feature on what is a very affordable and high-quality table. 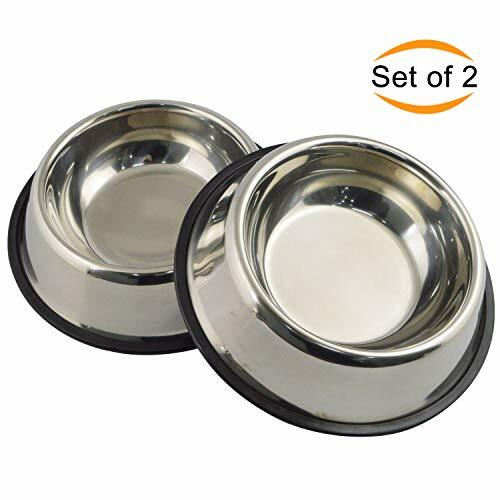 The two dog bowls within it – which you can use for wet and dry food separate, or one bowl for water – are made of rust-proof stainless steel, and can’t be chewed by those troublesome puppies. While they are easy for a human to remove from the table, they are a little more tricky for the dog, meaning they make less of a mess. When your dogs have eaten their food, you can then remove the bowls with ease, wash them in the dishwasher, and return them to the table. If the table is no longer needed, you can then fold it up and store it away. Once you’ve used a designer diner from Pet Zone, you will never go back to feeding your pets on the floor. If you struggle to set a regular feeding routine for your pets, why not buy a dog bowl that times your pet feeding time perfectly? This automatic feeder from PetSafe is suitable for both cats and dogs and is convenient for the owner who is away all day, is going to be late home and late to rise, or has a pet that requires regular, controlled feeds. This automatic feeder features four one-cup portion holes you can add food to, and you then set the clock and LCD monitor to allocate the food at certain times. If you’re putting your pet on a diet, or you want to restrict how fast your pet eats, this feeder will be a well-loved addition to your home. What’s more, the removable tray is dishwasher safe, and your pets will soon learn when food will appear in their bowl. Upon purchasing this dog bowl, you also need to buy four D-cell alkaline batteries as these are not included. If the thought of a chewed-up old dog bowl sitting in your lovely contemporary kitchen is something of which nightmares are made, consider this sleek set of dog bowls for dogs up to 70 pounds from URPOWER. Designed to be both classy and functional, two stainless-steel bowls sit neatly inside a non-skid bone-shaped frame that stands out from the crowd. Both of the rust-resistant bowls can hold 26 ounces of food and water, and the stand, made from silicone, won’t slide around as they eat their dinner. What’s more, it’s heavy enough to stop them from flipping it as well. The bone-shaped base is substantially bigger than the bowl too, which means that while they’re eating, no spillage will occur either. Dog bowls don’t have to be eyesores in your kitchen. Purchase this attractive set of stainless steel bowls in a sleek black bone-shaped base and enhance your kitchen rather than downgrade it. This set of dog bowls from Platinum Pets is designed to cater to all dogs of all sizes, and you’re sure to be impressed. From the color choices on offer to the sleek and contemporary design, who would have thought feeding your dog could be done in style? Platinum Pets is bucking the trend. The frame is made of powder-coated steel to be heavy-duty, robust, and easy to clean, while the bowls are something unique as well. They are made of non-toxic stainless steel that’s both easy to clean and surgical grade, and they are even resistant to scratches, chips, fading, and rust. If ever there were a pet feeder to last the distance, this one would be it. The two bowls that sit neatly within the frame are big enough for two cups of food in each, and once the food is eaten, you can then pop them in the dishwasher for cleaning. They don’t rattle when your cats or dogs are eating, and they are powder-coated for additional durability as well. Throw away that old plastic, chewed dog bowl, and upgrade your pet’s feeding area to a Platinum Pets double diner feeder. They will love you for it. Dogs come in all shapes and sizes; therefore it’s often not comfortable for them to eat out of dog bowls on the floor. If your dog is tall in the shoulders or has painful arthritic or stiff joints, consider this diner from PetMate. Designed to be easy to reach for all kinds of dogs, it’s an elevated feeder that has a stainless-steel bowl for both food and water. 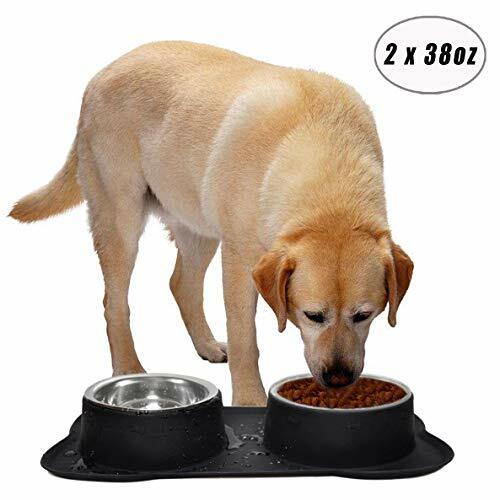 Instead of making your dog crouch down and eat in an uncomfortable position, you can provide him or her with a comfortable table that allows them to eat at head height instead. The table is available in either black or pearl tan, and these colors are contemporary and stylish to suit your home’s décor. The table also has bone-shaped handles for a nice touch, and these are convenient for moving the table from one area to the next. When it comes to cleaning up, it’s a breeze. Just remove each of the stainless-steel bowls, put them in the dishwasher, and replace them once they are clean. They pop out of place easy enough for a human, but a dog would struggle. Therefore, there is minimal risk of destruction and mayhem while they’re eating their dinner. 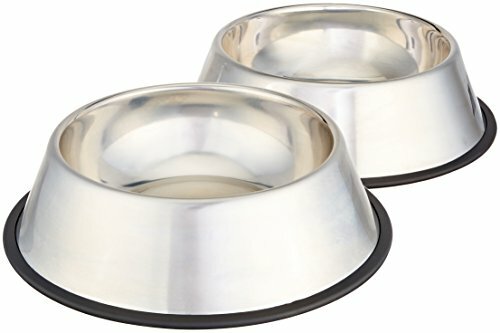 If you’re in the market for a comfortable, stylish, and functional dog bowl for your dog, consider this diner from PetMate. While traditionally, dog bowls were commonly put on the floor for dogs and cats to eat from, studies now show that it’s not the best position from which your pet should be eating. Instead, their bowls should be elevated. If you want to reduce the risk of indigestion or stomach problems in your dog and alleviate suffering from stiff or arthritic joints, consider a raised pet dog feeder from PandPal. This stunning bamboo feeder boasts an abundance of features you and your dog are sure to love, and the price tag is certainly no reflection of the quality on offer. Firstly, you can reap the rewards of a clean, bacteria and mold-free eating area. 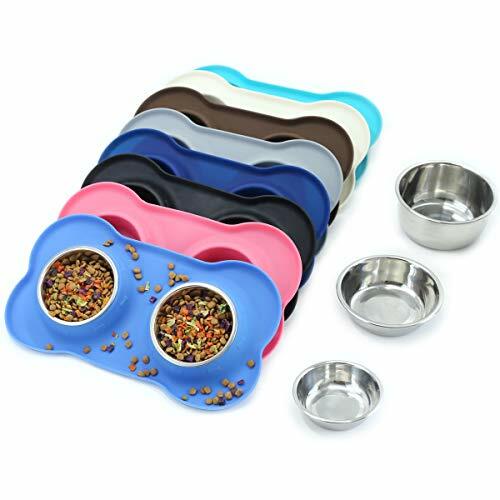 Surrounding the food and water bowls is a water-resistant silicone mat which keeps the bamboo frame and surrounding areas clean and tidy at all times. The benefits don’t end there. Dogs grow, and when you buy a dog bowl for them as a puppy, there’s every possibility it won’t meet their needs as they age. Therefore, it’s helpful to purchase a table that can be extended as they grow. This dog feeder can be adjusted from a small puppy all the way through to a medium or large dog. Keep your dog comfortable right from birth to old age. Unlike other dog bowls and feeders on the market, this PandPal feeder comes with four bowls opposed to two. As such, you can put two in the dishwasher for cleaning, and replace them with two immediately. Each of these stainless-steel bowls can also hold six cups of food – a perfect size for the growing pooch in your household. If you’re looking for a dog bowl that will grow with your dog, consider this feeder from Neater. Not everyone has a small dog, and those with larger dogs often struggle to find dog bowls and feeders that provide a comfortable eating experience. However, this one does. It’s suitable for dogs between 30 and 100 pounds, and even those standing 20 or more inches high in shoulder height. It’s made out of robust materials, is mess-proof to save you time cleaning after dinner, and can hold seven cups of food in one bowl, and nine in the other. For the large dog, these bowls will be more than suitable. If you find the feeder is too short for your dog’s requirements, you can then extend it. As standard, it’s eight inches high. However, you can extend it to 11 inches by attaching the supplied leg extension. Affordable, robust and designed to handle daily use with ease, there’s every reason to consider this feeder from Neater. If you’re strapped for space, consider a dog bowl that acts as a storage container as well as a feeder. 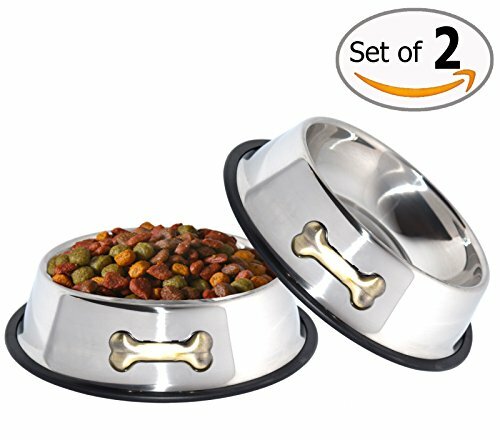 This unique feeder is designed to accommodate large dogs that don’t find it comfortable to eat from the floor but also acts as a container in which his or her food can be stored. The bowls will hold two quarts of water and food, while the storage container can contain as much as 64 cups of dry food. You can also rest assured the food stays fresh as the lid is sealed tight with a buckle design. 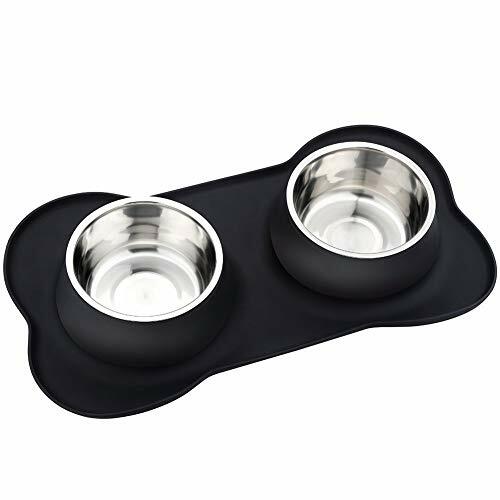 While this dog bowl is convenient for the dog with arthritis or stiff joints and digestive issues, it’s also suitable for an owner who is leaving someone else in charge of feeding their pets. Your pet sitter doesn’t have to wander through the house looking for the dog’s food. Instead, he or she can lift the feeder off the floor, open the lid, scoop food out and into the bowls, and then seal it shut again. It has never been easier to feed your dog until now. Consider buying a large elevated feeder from IRIS today. 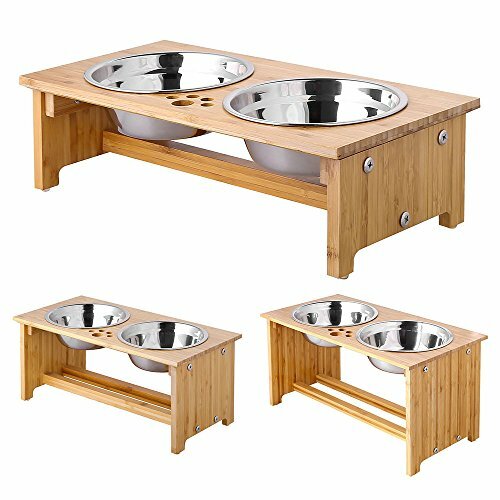 Choosing a dog bowl for your pet can be challenging, but with this bamboo dog bowl, it’s a natural choice. It’s raised off the ground to promote digestive health and relieve pain from arthritic joints, and it’s cleaner due to not giving mold a chance to grow underneath it. This bowl set also comes with two stainless steel bowls within a beautiful, non-toxic, food-grade bamboo frame. It looks stunning in any home, all the while being functional for your pets. While the frame itself is designed to last the distance, you will be more than impressed with the robustness of the bowls as well. Both dishes are resistant to rust and corrosion while being heat resistant and easy to clean too. 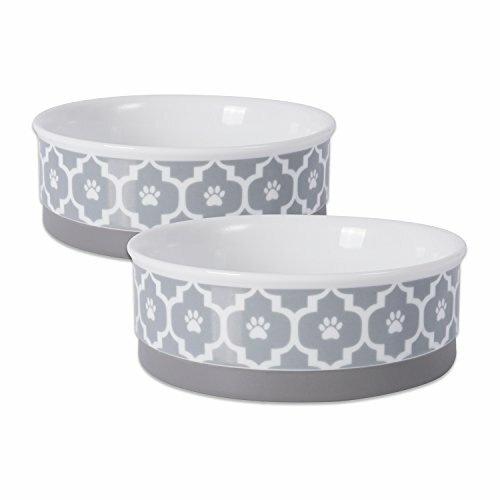 These bowls for cats and dogs tick all the boxes for you as a pet owner.